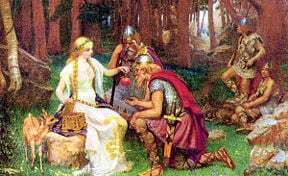 The Norse gods were mortal, and only through Iðunn's apples could they hope to live until Ragnarök. Image by J. Penrose, 1890. In Old Norse, the Æsir or Aesir are the principal gods of the Norse pantheon. They are one of two major clans of Norse deities (the other being the Vanir). Among the Aesir are many famous figures found in the Scandinavian tales such as Odin, Frigg, Thor, Baldr and Tyr. These Norse gods are understood to dwell in Asgard, a realm separated from the mortal world (Midgard) by Bifrost (the rainbow bridge). The mythic sources also occasionally utilize the term "Aesir" as a general collective noun for all Norse gods (both Aesir and Vanir). Norse Mythology is renowned for its rich tapestry of colorful stories, memorable characters, heroic sacrifice, and epic battles. In the history of northern Europe, this collection of tales brought meaning and purpose to both the Scandinavian peoples and the northern Germanic tribes for many centuries. The Proto-Germanic word *ansuz is believed to be derived from the Proto-Indo-European *ansu (meaning breath, god). The cognate Old English term is os, which can be translated as “god,” or “deity.” Ása is the genitive form that appears as a prefix to indicate membership in the Æsir in "Ása-Þórr," and also in the compound Ásatrú, a sect of Germanic Neopaganism. The twelfth-century Icelandic historian Snorri Sturluson's Ynglinga saga mistakenly identifies the Æsir with Asia, an explanation repeated as late as in the seventeenth century by Johannes Schefferus, who held that Æsir referred to "Asian emperors." As Norse deities, the Aesir belonged to a complex religious, mythological and cosmological belief system shared by the Scandinavian and Germanic peoples. This mythological tradition, of which the Scandinavian (and particularly Icelandic) sub-groups are best preserved, developed in the period from the first manifestations of religious and material culture in approximately 1000 B.C.E. until the Christianization of the area, a process that occurred primarily from 900-1200 C.E. The tales recorded within this mythological corpus tend to exemplify a unified cultural focus on physical prowess and military might. Within this framework, Norse cosmology postulates three separate "clans" of deities: the Aesir, the Vanir, and the Jotun. The distinction between Aesir and Vanir is relative, for the two are said to have made peace, exchanged hostages, intermarried and reigned together after a prolonged war. In fact, the most significant divergence between the two groups is in their respective areas of influence, with the Aesir representing war and conquest, and the Vanir representing exploration, fertility and wealth. The Jotun, on the other hand, are seen as a generally malefic (though wise) race of giants who represented the primary adversaries of the Aesir and Vanir. The Æsir, though immortal, were somewhat more "perishable" than their Indo-European brethren. Not only was their eternal youth maintained artificially (through the consumption of Iðunn's golden apples), they could also be slain (for instance, many were preordained to perish at the cataclysmic battle of Ragnarök). The multifarious forms of interaction between the Aesir and the Vanir present an oft-addressed conundrum for scholars of myth and religion. Unlike other polytheistic cultures, where families of gods were typically understood as "elder" or "younger" (as with the Titans and the Olympians of ancient Greece), the Aesir and Vanir were portrayed as contemporary. As described above, the two clans fought battles, concluded treaties, and exchanged hostages. Given the difference between their roles/emphases, some scholars have speculated that the interactions between the Aesir and the Vanir reflect the types of interaction the were occurring between social classes (or clans) within Norse society at the time. According to another theory, the Vanir (and the fertility cult associated with them) may be more archaic than that of the more warlike Aesir, such that the mythical war may mirror a half-remembered religious conflict. Another historical perspective is that the inter-pantheon interaction may be an apotheosization of the conflict between the Romans and the Sabines. Finally, the noted comparative religion scholar Mircea Eliade speculated this conflict is actually a later version of an Indo-European myth concerning the conflict between and eventual integration of a pantheon of sky/warrior/ruler gods and a pantheon of earth/economics/fertility gods, with no strict historical antecedents. Note: Each of these deities are described in far greater detail in their respective articles. Týr — (Tyr) one-handed, self sacrificing god of law and justice. ↑ See Ynglinga Saga, Laing's translation (2). ↑ Lindow, 6-8. Though some scholars have argued against the homogenizing effect of grouping these various traditions together under the rubric of “Norse Mythology,” the profoundly exploratory/nomadic nature of Viking society tends to overrule such objections. As Thomas DuBois cogently argues, “[w]hatever else we may say about the various peoples of the North during the Viking Age, then, we cannot claim that they were isolated from or ignorant of their neighbors…As religion expresses the concerns and experiences of its human adherents, so it changes continually in response to cultural, economic, and environmental factors. Ideas and ideals passed between communities with frequency and regularity, leading to and interdependent and intercultural region with broad commonalities of religion and worldview” (27-28). ↑ More specifically, Georges Dumézil, one of the foremost authorities on the Norse tradition and a noted comparitivist, argues quite persuasively that the Aesir/Vanir distinction is a component of a larger triadic division (between ruler gods, warrior gods, and gods of agriculture and commerce) that is echoed among the Indo-European cosmologies (from Vedic India, through Rome and into the Germanic North). Further, he notes that this distinction conforms to patterns of social organization found in all of these societies. See Georges Dumézil's Gods of the Ancient Northmen (especially pp. xi-xiii, 3-25) for more details. ↑ This argument was first suggested by Wilhelm Mannhardt in 1877 (as described in Dumézil, xxiii and Munch, 288). On a similar note, Marija Gimbutas argues that the Aesir and the Vanir represent the displacement of an indigenous Indo-European group by a tribe of warlike invaders (in following her Kurgan hypothesis). See her case in The Living Goddess for more details. ↑ Turville-Petre, 161. See especially ff. 37. The Poetic Edda. Translated and with notes by Henry Adams Bellows. Princeton: Princeton University Press, 1936. Accessed online at sacred-texts.com. Sturluson, Snorri. The Prose Edda. Translated from the Icelandic and with an introduction by Arthur Gilchrist Brodeur. New York: American-Scandinavian Foundation, 1916. Available online at the Northvegr Foundation. This page was last modified on 15 February 2016, at 16:38.